Keith Ciaramello has already published two critically acclaimed instructional DVDs, Keep It Real 1 and 2, which focus on both color and black and gray portraiture. 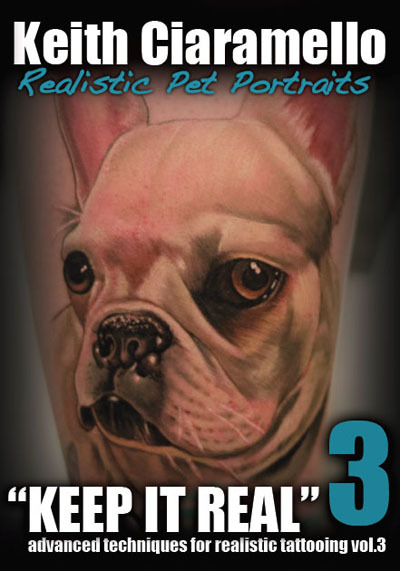 Now with Volume 3 he offers an insightful glimpse into pet portraiture, which has recently become a popular- and sometimes surprisingly striking- tattoo motif. In Keith's approach you can see how his foundation in painting and other mediums translates into his painterly approach to handling subtle realistic color on skin. It shows pretty much the entire tattoo process over the course of 4 hours on 2 DVDs, with the whole procedure described in detail. It's meant for tattooists who already have a solid foundation of basic technique and are looking to take their realism work to the next level.